No matter what customers are interested in, from tile to carpet to wood or vinyl, Carpet Masters of Colorado has a dazzling array of available options, all under one roof. 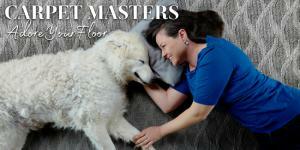 With so many options from carpet to hard flooring, the expertise found at Carpet Masters of Colorado is a big bonus. One of the primary qualities that sets Carpet Masters of Colorado apart from other flooring stores is a large selection of first quality carpet and vinyl. LONGMONT, CO, USA, April 1, 2019 /EINPresswire.com/ -- Thirty-one years in business is no small feat. Not only has Carpet Masters of Colorado managed to survive and prosper for thirty-one years, but along the way, they have earned numerous awards for their exceptional service, including the Times-Call Reader's Choice Award for Best Flooring Store many years in a row. They also won Best Flooring Store for Best of Boulder County East in 2017. "We are flooring experts, and we are passionate about what we do," says Mishelle Nauman, owner of Carpet Masters of Colorado. One of the primary qualities that set Carpet Masters of Colorado apart from other flooring stores is that they carry a large selection of first quality carpet and vinyl. Many other companies focus on seconds and discontinued products-something that Nauman warns customers to be wary of. "When shopping for in-stock flooring, make sure you ask if the product is a first quality," she says. "Seconds often times have defects and no warranties." Because Carpet Masters of Colorado is confident in the quality and functionality of all of their products, the company offers a customer peace-of-mind guarantee on most products for up to 60 days. Another feature that makes Carpet Masters of Colorado different from other flooring stores is that the company pre-cuts all carpet in their warehouse prior to installation. "We do this for several reasons," says Nauman. "First, to check the quality of the product and ensure it is free from defects, and second, so that the customers' carpet is not rolled out on the street or driveway where it can pick up dirt and debris." Carpet Masters of Colorado believes that the shopping experience itself is just as important as the customer's satisfaction with the finished product. "When people come to Carpet Masters, they can relax and take their time looking at all the beautiful choices we have to offer, feel free to ask questions, and will never be rushed through the process," Nauman says. "We constantly work to bring the newest and innovative products to our customers. Our showroom is always being updated to ensure our clients have a positive buying experience." Located at 618 South Sunset Street, the Carpet Masters of Colorado showroom features all the flooring brands you know and trust, including Creative Elegance, Designer's Choice, Signature Style, Royal Stainmaster, Mohawk, Shaw, Armstrong, Daltile, Legacy, Mullican and the full line of Coretec waterproof flooring. 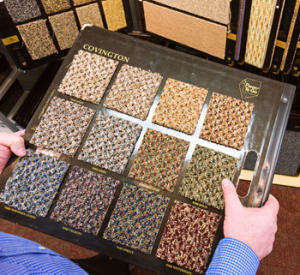 Not only can you experience these flooring options firsthand at the showroom, but Carpet Masters of Colorado has also made it easy to see exactly what a certain type of flooring would look like in your personal space. "Our website offers customers the opportunity to use our exclusive room visualizer, where they can look at flooring before they purchase in a preloaded room scene, or upload a photo of their own space," says Nauman. Floors and window treatments go hand in hand. In an effort to make the decoration of your home easier and more seamless, Carpet Masters of Colorado also sells a full line of high-quality window coverings by Hunter Douglas and Graber Window Fashions. Their broad selection of window treatments includes shades, drapes, shutters, blinds, valances, and cornices. Customers can select window coverings according to their style, as well as their needs for lighting, privacy and reduced energy consumption. Designers at Carpet Masters of Colorado can help you select the perfect window treatments to complement your flooring, and can custom fit any size or shape of the window. 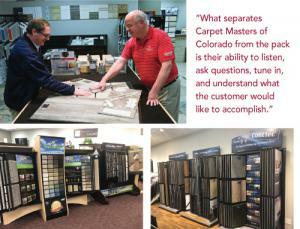 As a locally-owned business, Carpet Masters of Colorado recognizes the power of investing directly into their community. The business proudly supports a variety of nonprofits in the area, including Meals on Wheels, Mountain States Children's Home, Habitat for Humanity, St. Jude Children's Research Hospital, SOS Outreach, Colorado State High School Rodeo Association, A Woman's Work, TLC Learning Center, and The Inn Between of Longmont. Carpet Masters of Colorado is also a member of CARE, the Carpet America Recovery Effort. CARE's mission is to encourage recycling of post-consumer carpet and divert carpet waste from landfills. Carpet Masters of Colorado's membership with CARE demonstrates a commitment to sustainability and environmental stewardship. To understand the high level of service provided by Carpet Masters of Colorado, one simply has to read their Google reviews-something that Nauman encourages. "Our focus on customer satisfaction is obvious if you read our reviews," she says. Nauman ensures the legitimacy of all online Carpet Masters of Colorado reviews by using a third party review company. "All of the reviews online are from real customers and the comments are in their words," she says. Customer Mike M., who replaced the carpet in his home with Armstrong Luxury Vinyl Plank, says, "What separates Carpet Masters of Colorado from the pack is their ability to listen, ask questions, tune in, and understand what the customer would like to accomplish." He goes on to serve high praise for Carpet Masters in every step of the process, from selection to installation to follow up. "Their dedication to the details is what makes the difference in an install and a flawless install," he says. "They arrived as scheduled, worked hard, remained professional and carried out their duties with a positive and can-do attitude."